New findings on microglial activation during neuroinflammation. Inflammatory processes occur in the brain in conjunction with stroke and neurological diseases such as Alzheimer’s and Parkinson’s disease. Researchers from Lund University, the Karolinska Institutet and the University of Sevill have presented new findings about some of the ‘key players’ in inflammation. In the long term, these findings could lead to new treatments. The opensource study is published in Cell Reports. The current study demonstrated that galectin-3 is secreted by microglial cells, a type of immune cell in the brain. The protein binds to the TLR4 receptor and amplifies the reactions that lead to inflammation. More galectin-3 is produced and binds to the immune cells, and the immune response is further intensified in a self-sustaining process. The team state that they have proven the importance of the link between the two ‘key players’ using various different methods and in laboratory tests, animal experiments and human trials. They have shown that mice genetically modified to be incapable of synthesising galectin-3 show a lower inflammatory response and less brain damage after a heart attack. Mice with a model of Parkinson’s disease also suffer less brain damage if they do not have the gene for galectin-3. The interaction between galectin-3 and TLR4 in the brains of people who died of a stroke was also observed in the current study. The team explain that this link could be part of the residual disability that stroke patients often experience. High levels of galectin-3 remain in the brains of these patients long after the stroke, which may explain why the inflammatory response continues to cause damage and does not subside. The researchers state that galectin-3 is already a target for pharmaceutical companies trying to develop agents that hinder the harmful effects of the protein in neuroinflammatory diseases. The new findings on the effects and role of the protein in a diseased or damaged brain should provide important input to this work. The team summise that previously, it was acknowledged that galectin-3 contributed to the inflammatory response but the mechanism wasn’t clear. The protein is not present in a healthy brain, only in one that is suffering an inflammatory response and now that the mechanism is understood, it will make it easier to develop more effective treatments. Inflammatory response induced by microglia plays a critical role in the demise of neuronal populations in neuroinflammatory diseases. Although the role of toll-like receptor 4 (TLR4) in microglia’s inflammatory response is fully acknowledged, little is known about endogenous ligands that trigger TLR4 activation. Here, we report that galectin-3 (Gal3) released by microglia acts as an endogenous paracrine TLR4 ligand. Gal3-TLR4 interaction was further confirmed in a murine neuroinflammatory model (intranigral lipopolysaccharide [LPS] injection) and in human stroke subjects. Depletion of Gal3 exerted neuroprotective and anti-inflammatory effects following global brain ischemia and in the neuroinflammatory LPS model. 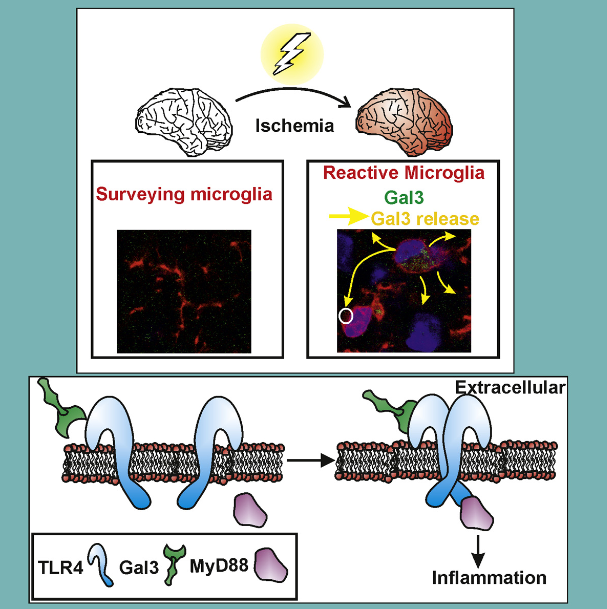 These results suggest that Gal3-dependent-TLR4 activation could contribute to sustained microglia activation, prolonging the inflammatory response in the brain. Microglia-Secreted Galectin-3 Acts as a Toll-like Receptor 4 Ligand and Contributes to Microglial Activation. Burguillos et al 2015. It has always been theorised that human blood would carry-relevant molecular signatures that can be used to detect the disorder. Is there a validated Biomarker for regeneration and myelination in the human brain ?